Edward "Harold" Mahar - age 88, of Meadowview, passed away on Friday, February 8, 2019 in the Valley Regional Hospital. Born in Waterville, he was a son of the late Thomas and Jessie (Mapplebeck) Mahar. 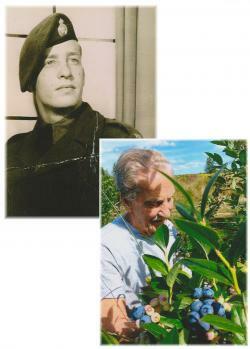 Harold was a Veteran of the Korean War, serving with the PPCLI Special Forces. He also worked as a cook in the army. After serving, he enjoyed working in construction with V.C. Woodworth and Topline Ventures Ltd. Harold enjoyed fishing, trapping, country music and playing baseball for the Meadowview Aces. He is survived by his wife of 68 years Dorothy (Benjamin); four daughters, Patsy (Donald) Rogers, Kentville; Laverne Mahar (Ken England), South Alton; Cindy Mahar (Darrell Bezanson), Kentville; Margaret (David) Lenihan, Kentville; three sons, Ronald (Mary Varner), Kentville; Ted (Kelly), Prospect Road; Rick, Cambridge; three sisters, Anna Huntley, Berwick; Harriet Oulton, New Brunswick; Mary Kalkman (Hal Walsh), Hants County; brother, Thomas, Halifax; 13 grandchildren, 26 great-grandchildren; three great-great-grandchildren; special friend and caregiver, Charlie Doucette, Waterville; many nieces and nephews. Besides his parents, he was predeceased by his step-mother, Catherine (Caldwell) Mahar; sisters, Beatrice Stockman; Clara Penny; Helen Darby; Katherine Baxter; brothers, Charles and Shirly. Cremation has taken place. Visitation will be held from 6-8 p.m. on Monday, February 11, 2019 with a Royal Canadian Legion Service to be held at 6:00 p.m. in the White Family Funeral Home, Kentville, where the funeral service will take place at 2:00 p.m. on Tuesday, February 12, 2019, Pastor Christina Bigelow officiating. Following the service, a reception will be held in the Meadowview Community Hall. Burial will take place at a later date in the Elm Grove Cemetery, Steam Mill. Donations in memory may be made to the Meadowview Community Hall. Funeral arrangements have been entrusted to the White Family Funeral Home and Cremation Services, Kentville. Burial will take place at a later date in the Elm Grove Cemetery, Steam Mill.